On Monday night, 18 March, two of our Year 10 Science students namely Ethan Redpath and Lizzie Reedman were invited to give a short presentation to the local Glasshouse Rotary Club. In January this year, Ethan and Lizzie attended the four-day ConocoPhillips ‘Science Experience’ which was held at the University of Queensland, Griffith University and QUT campuses. This four-day ‘Science Experience’ was fully sponsored by the Glasshouse Rotary Club. At the Rotary Club meeting Ethan and Lizzie confidently outlined the activities and workshops they attended during the four-day ‘Science Experience’. In attendance at the monthly meeting were the famous Irwin family. Terri, Bindi and Robert were all very impressed by Ethan’s and Lizzie’s presentations on the evening. 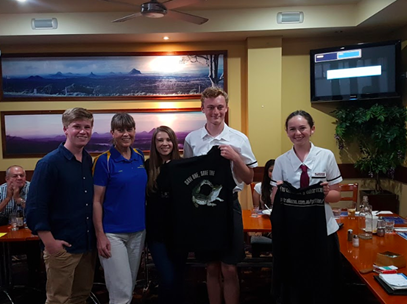 Terri presented both students with an Australian Zoo “Save the Croc” T-shirt as a memento of the occasion. The secretary of the club Ian Hope also congratulated both of our students on their informative talks. On behalf of Glasshouse Christian College I would like to thank the Glasshouse Rotary Club for their continued financial sponsorship of our Science students. Any Year 9 Science student who is interested in applying for next years ‘Science Experience’ please see Mr Doolan by the end of this term. This entry was posted in Senior School News and tagged Glasshouse Rotary Club, Irwin Family on March 26, 2019 by sandy.